no I'm talking about the river tribes. they are usually above water, but live on it. If i remember right. so to defend their cities on the river, they could shoot from their city at the people attacking from the banks. the picture would probably be when the river tribe is on the offensive. But Hydro does do a great job, i wish i could draw with even half the talent he does. wouldn't river based civilizations use ranged weapons? Sure you would still need infantrymen, but as the village or city has a natural defense in the river, i would think ranged weaponry would be better able to defend the city, until the attacking army breaks through the defenses. But then again, this would be totally different if the river tribe was the attacking army. Just thoughts, nothing more. And you draw really well, whenever you update this, i am always coming back. Keep it up! Yes there is ranged too but i was sticking with the melee untits for now so i can really show the advances in metals (stone, copper, bronze, iron). I already mentioned in the Bronze age they have double bladed longbows. These still exist but in composite bow and iron blades. 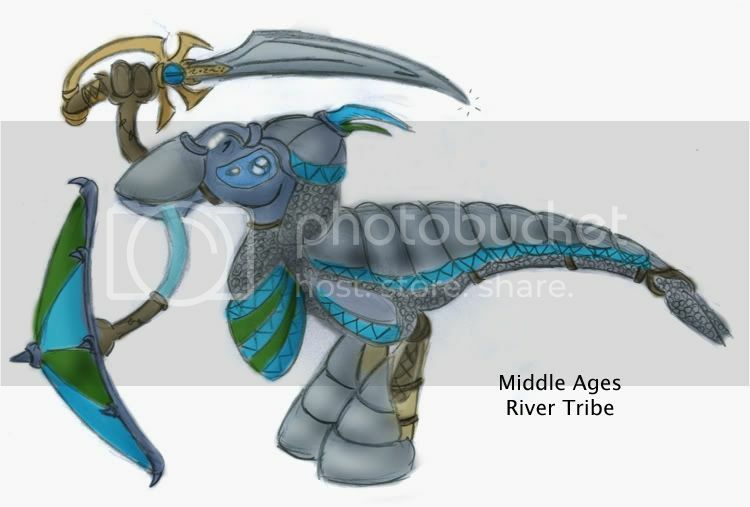 Here is a typical melee unit of the River Tribe Middle Ages. Due to the ever increasing opposition of more armored Nauceans the river tribe too had to face this. One compromise of weight and protection came with chainmail. Which replaced padded armor still underneed the iron plate armor. Their quill sword have advanced too to become broader and thicker to slice through such armor. Some of the strongest Nauceans fight during this time. Where tentacle muscles bulged. Not shown here is the armored War Lystrophants and Composite Double Bladed Long Bows. The river tribe are known for their advanced archers who shoot from high atop their river castles. Durring this time advanced siege equipment was developed to take out these castles in the river. Not much of a change.. Still a very good drawng and all. I like the way the chainmail covers his hind fleet. Nice! 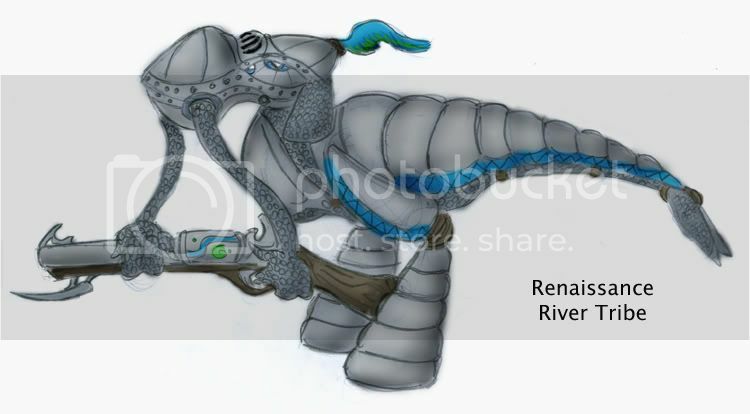 Here is a Renaissance River Tribe hand cannoneer. As you can see the River tribe were the first to discover gun powder and took the advantage over the other tribes. They also kept up with the armor race in which this shows it has full plate. Sadly this will be all for nothing in the future because as gun powderer gets better the slow armored knight will be obsolete. If you also notice the whole body is covered with metal except for the eyes which have 4 holes and on the top where the nostril is has a grate to breathe through. Also even the 3 main tentacles are covered in chainmail. it definetly reflects the evolution of armor in our history, the dark ages one would be after the roman empire fell, but before chain-mail became common, the middle ages would be when armor was more common and chain mail was more common, and the renaissance one would be at the peak of the age of armor, before guns got powerful enough. from the looks of that, it seems to be an early hand cannon, before the technology was widespread and they were still expensive to produce (and thus would only be owned by soldiers or governments with the cash). I know i jumped the Imperial age (Earth's 1500-1700 AD) but had a great idea for this Industrial Age picture. 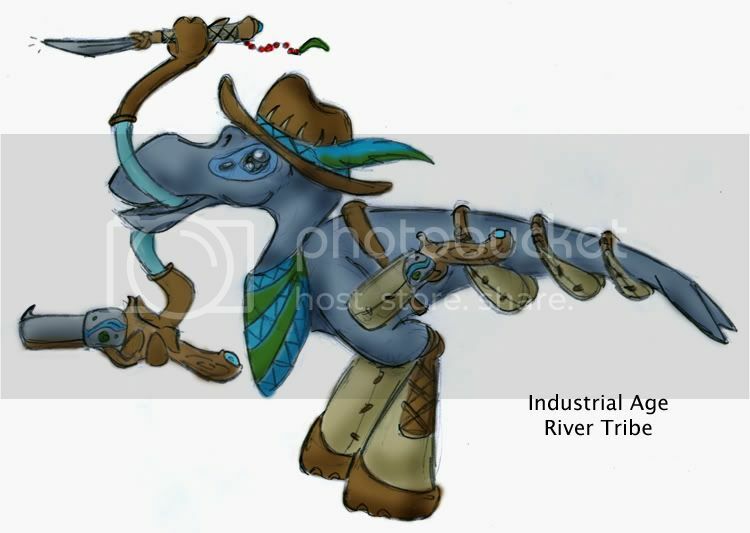 This picture is the Industial Age River Tribe. As you can see it is very much like America's Cowboys or other Colonies like Australia or South Africa. Durring the previous age they discovered a new contentent and have already started colonization of it. Which are still within the River Tribe Empire. In his hand is a revolver which is better than the flint lock of the previous age. In the 6 sacks attacked to the tail is ammo and supplies. He also has a quill dagger which is a current version of the Quill blade once used. His hand helps keep the glare hot sun off his eyes and he wears gloves and floots made of a new world beast's hide. As more and more industrialization comes the more polluted their homelands becomes and they must ever seek out new clean areas to get resources from. This is one of the most destructive times where many creatures become extinct do to over hunting. Also there is talk about anti-slavery of the Ocean, Mud and Jungle Tribes who were enslaved by mass during the Imperial age by the River, Grassland, Cave, Mountain and Desert Tribes. Hey, I've been reading about your Naucean and all i can say is that its the coolest and most creative thing i've seen. But could you tell me how exactly you draw, and more specificly how you color your pictures. I'm planing on drawing somthing like it myself. Four Feet Good, Two Feet Bad! Well first i draw them out in pencil. Then i scan the pencil drawing into Adobe Photoshop. Then i make 3 layers. The Bottom layer is the color, the middle is the line drawing put on a function called "multiply" Basiclly it makes all white parts transparent so you can see the color under the line drawing. Sortta like a coloring book. Then the top layer is the text i put on it. Thanks alot. I hope I can show you all my alien soon. That's a great pic Hydro! We needed some cownauceans!